Due to work commitments the horses have had to take a back seat in terms of competing this month, although I have been training hard ready for our outing to get them all qualified for the winter regionals. With over 25 snags and handovers to do for Cyden Homes it could be said that I have had a busy six weeks but I am pleased to say all went well with lots of lovely new families all moved in to their new homes. The horses have been going really well in training. Felix is so close to being ready to come out at Prix St Georges and Bodyguard at Inter 2, although it is a little bit like the blind leading the blind at this level. We travelled to Sheepgate Equestrian for our first Inter 2 and I am pleased to report Bodyguard was a superstar with just a slight issue with the fact that I had learnt completely the wrong test! After a couple of errors the judge kindly gave me the test and Jess (my Groom) read it to me. Not the best preparation but we managed just short of 64%. Felix also got 67.9% in the Small Tour qualifier so I am over the moon. 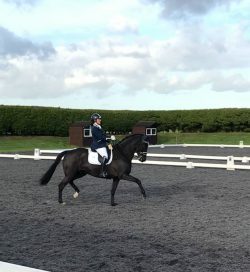 Chanel, my homebred baby by Cadans got 69% in her first test to take first place and then went on to win the second test on 73% which was a fantastic result for only her second trip away from home. This was all the more impressive considering I only decided to take Chanel the night before the show. Cleo was meant to be having her first outing but an unlucky kick in the field hadn’t healed well enough to take her so Chanel got dragged out of her stable at 8pm, clipped and was loaded onto the lorry at 7am the following day. What a star she was, and this followed a week’s holiday. Jasmine, our homebred three-year-old by Cadans, has left us for her new life as an eventer with the talented rider, Kristina Hall Jackson. Although I was hoping for her to be my up and coming homebred dressage horse, her love was jumping. I jumped her a couple of times and she was so bold and happy it just wasn’t fair on her not to use this natural talent. I am very much looking forward to watching and supporting them in four-year-old British Eventing classes. Gary, Annabelle and I managed four days away to Center Parcs with our lovely friends Kate and James, which was well overdue and needed. It was a lovely few days just chilling and having quality time with Annabelle and Gary. I am also thrilled to announce Annabelle is going to be an older sister! Baby girl number two is due at the end of April 2018.Gary and I are super excited for another bundle of joy to join our family but that will be it! I am hoping the pregnancy will be as easy as with Annabelle in terms of riding right up until the week before the birth and then back in the saddle a couple of days later, but we will wait and see, as they say all births are a little different!